One of the things i’ve been reading a fair bit about in the last few days is technical analysis (TA). Obviously this is a massive subject with 100+ years of techniques and strategies to get your head around. However one of the things that has really stood out to me recently is the need to be more certain about when to enter and exit the market. Various Flags, Pennants, and Wedges! I’m also pretty comfortable with the Fibonacci series and how that can be used to look at likely support and resistance points. I’ve still got learning to do around tracking volume, RSI and MACD. Anyhow, with regards the main point of the post, Stop buy orders and buying on confirmation. The concept is, that actually you don’t always want to buy at the lowest possible point, because you are trying to manage risk. 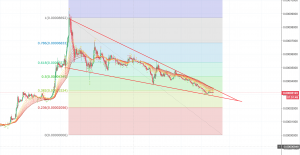 For example if you look at something like Cardano (ADA) which has been gradually moving downwards in a wedge shape for the last few days, it is in this falling wedge but the movements are getting ever smaller. In addition it’s hovering around the major support level presented at the 3124 satoshi mark which is the top of previous highs in mid to late December. Therefore what we’re looking for is a breakout above the falling channel. To my mind then, if ADA breaks out above 3350 sats there is a good chance with enough volume, that it will have broken the bear market and is heading higher again. With all that in mind, you could therefore argue that waiting to buy in at somewhere in the 3500 mark or would be a good plan. First we start with the buy settings. 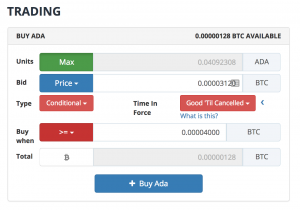 Then we end up with this, which to my mind means that if ADA goes above 4000 satoshi we will buy. I’m going to test this out and see where things go. 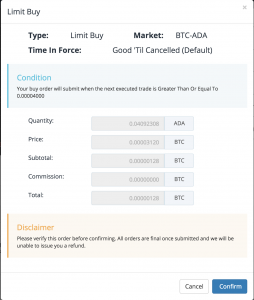 Obviously it would be great to also be able to put in your limit sell order at the same time. I think on Bitfinex more of that is possible, i.e. stacking orders, but I’ve not signed up yet so will keep researching.